The 53-year-old Good Morning Britain host turned his sharp tongue on the BAFTAs 2019 as viewers flocked to Twitter to complain about host Joanna Lumley, 72. “Jeez, who wrote these jokes for Joanna Lumley?” he wrote, in view of his 6.5 million followers. 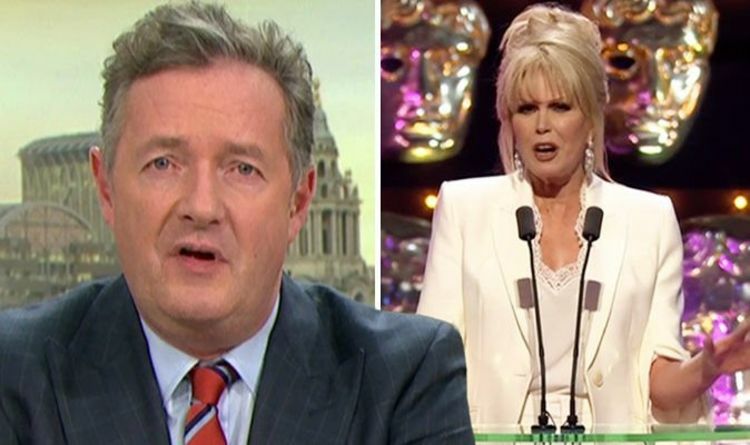 “This is a train wreck.” Piers Morgan later added: “Can somebody at #BAFTAs2019 make us laugh? A good joke, saying something really stupid, offending royals, tumbling off the stage — anything. “This is tortuous,” he said. The Good Morning Britain presenter also replied to a fan who insisted Ricky Gervais “should host every award show as law”. “100 per cent,” he said, adding a thumbs up emoji. He wasn’t the only viewer who took to social media to complain about the humour at the ceremony, which was held at the Royal Albert Hall in London. Many more called the jokes “terrible”. There was little response from the audience. She later quipped: “[Bradley Cooper] has been nominated for five categories, which makes him a multi-talented genius. “Though it does also probably mean that he probably needs to learn how to delegate,” she added, to yet more half-hearted titters from the crowd. On the subject of The Favourite which was nominated for a staggering 12 awards, she said: “What a masterstroke to have called it The Favourite. Meanwhile, the red carpet at the BAFTAs was swarmed with stars including Bohemian Rhapsody’s Rami Malek, 37, and his co-star and girlfriend Lucy Boynton, 24, First Man star Claire Foy, 34, and The Favourite’s Rachel Weisz, 48. BBC Radio 1 DJ Maya Jama risked a major wardrobe malfunction as she flashed her bare breasts posing for photographers in a sheer black dress.